0.10mm End Mill with ring, used to mill large paths in the FR4 board material. These mills can be used for copper removal by providing straight-sided and flat-bottomed isolation paths with minimal penetration into the substrate. Recommended for insulation milling of RF and Microwave circuitry. 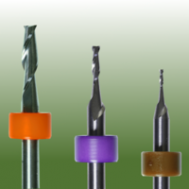 Endmills include distance rings for systems with automatic tool change. Used for rub out paths.